Bob Smith was just an ordinary teenage boy who thought he was in love. When his would-be girlfriend rejected his advances, Bob was crushed and proceeded outside where a group of bullies was waiting for him. A sudden burst of Energy X healed his mushy mind and gave him the power to generate and control gobs of purple goo. Being a good kid, he used these powers to punish evildoers in his own unique style. While he did not at first want to join Doc, he soon came to realize that even he could not defeat every threat by himself. As a member of Liberty Inc., he has learned to calm down somewhat, although he's always more than willing to leave the team when there are no critical threats and continue his unconventional war against crime alone. 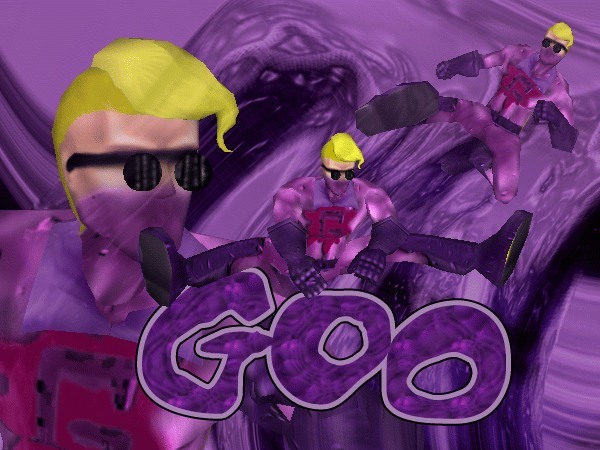 Goo has the ability to generate and control blobs of purple goo. So long as the goo stays in contact with his body, he can control its density, elasticity, and thickness as if it were an extention of his body. He can also re-absorb it, causing it to dissappear. Once the goo breaks contact with his body, however, it becomes locked into whatever characteristics he gave it last. Control cannot be regained even if he touches it again. His costume is made out of layers of this goo placed over his regular clothing. This allows him to switch identities very quickly and easily. The costume acts as body armor, and can change from a more elastic coating, to a much denser, nearly bulletproof form. The goo boots act as spring, allowing him to jump great distances, although control over these jumps is rather limited, and to anchor him to the ground when needed. The goo gloves are very dense and hard, although still light, allowing him to deliver harder than average punches. The goo can be used for a variety of purposes besides as a convenient and useful costume, limited only by Goo's imagination. Common uses include pasting enemies to the ground, forming temporary mace-like weapons, and blinding enemies with a nearly liquid spray. The goo does have one weakness, however. Extreme temperatures rend it uncontrollable. Heat causes it to melt and cold to become brittle and break apart. Goo always tries to avoid these two extremes, but his weakness was discovered in the beginning of his career by Pinstripe's mafiosos, and is now well known amoung the criminals and supervillians of Patriot City.